The Saf-T-Ball stick flags are manufactured by Annin & Co. 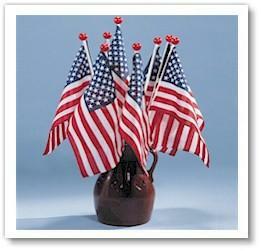 This 8x12" American flag is great for parades and holiday gatherings. Annin American flags feature a red ball tip. **Color of staff and ball may vary. Please call if staff color is critical to verify availability.